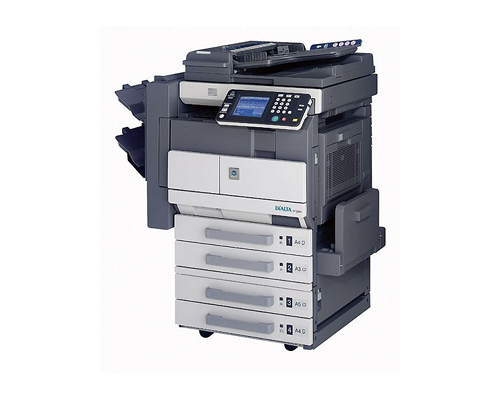 The Konica Minolta DI3510 is an all-in-one unit that's as forward as it is backwards-compatible, offering still-respectable speeds across almost all of its functions -- copying, faxing, printing, and scanning -- and support for both newer and older systems. 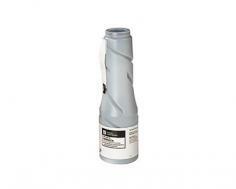 The all-in-one unit measures 26 3/4" by 28" by 28 1/4" and weighs 163 pounds. This makes it much too large for a desk or a piece of furniture shared with other hardware, but the device will sit comfortably on a credenza. The 3510 has a standard input capacity of 1150 sheets, expandable to a maximum of 4000, adequate to meet the needs of most office environments. The unit has an optional automatic document feeder capable of loading up to 80 sheets at a time and an included multi-bypass tray with a maximum of 150 sheets. It can sort, staple, punch holes, crease folds, and perform mailbin sorting in its finishing modes. Duplexing is automatic. If necessary, the 3510 also supports cost accounting and can accomodate Coin & Card systems as well as PageScope Netcare Accounting, as well as Microsoft Management Console. The unit supports printing and copying to paper sizes between A6 and A3, with a minimum size of 5 1/2" by 8 1/2" to 11" by 17". The copier produces up to 35 copies per minute when processing A4-sized sheets of paper at a maximum resolution of 600 dpi. It can magnify and reduce documents between the sizes of 25% and 400%, configurable in .1% increments. It includes 64MB of memory, expandable to 128MB, and a 40GB internal hard drive for storing jobs. The printer prints up to 35 pages per minute at a maximum resolution of 600 dpi. It includes 192 MB of memory, expandable up to 286 MB, and an optional 16 GB hard drive (without it, it shares storage with the copier's hard drive). It can be interfaced to computers via IEEE-1284 parallel ports, USB, IEEE-1394 Firewire, 10/100Base-T ethernet, Token Ring networking, or via 802.11b wireless networking. It also includes drives for all versions of Windows beginning at Windows 95, many Linux and Unix distributions, and Mac OS as far back as 7.5.3. This means that at least the unit's printing functions will be accessible from virtually any system built in the last fifteen years, making the Di3510 a good choice for an office transitioning between hardware, or one that, for various reasons, is bound to older systems or many operating systems to run specific applications. The fax machine runs off of a 33.6kbps modem, but also supports internet fax, PC fax, delayed transmission faxing, broadcasting, polling, and memory receiving. All memory is shared with the copier. The scanner scans a maximum of 70 scans per minute at a maximum of 600 dpi and supports TWAIN, scan-to-HDD, scanning to email, scanning to FTP, and scanning to URL. Many printers, copiers and scanners support higher resolutions, up to 1200 dpi, than the DI3510. If high-resolution imaging is a concern for your work environment, a 1200 dpi all-in-one unit may be worth considering, as in this respect this unit is now several years behind its competition. Scan to FTP and TWAIN will require PageScope software and drivers, possibly an additional business expense and likely requiring semi-regular updates to ensure proper function. However, PageScope does include many features that you may find useful if the unit is regularly used to scan documents, such as image enhancement and document annotation. Note, however, that PageScope is not available for Mac OS X according to Konica Minolta's documentation, meaning that TWAIN and Scan to FTP will need to be run by another means on Macs. 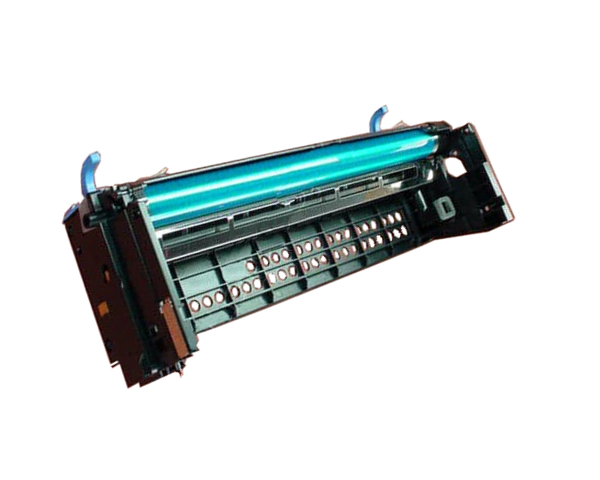 Review it: "Konica Minolta Di3510 "
The 3510 requires replacement of three components -- toner, drum, and developer -- at different time periods. The 3510's toner prints 14000 pages with an average coverage of 5%, at which point it will need replacing. The drum requires replacing at 80000 pages and the developer at 40000. This brings down maintenance costs as all parts are separate, but does bring up the amount of maintenance one will need to do and in order to keep the unit operational.